Vivek is a technology driven individual who has always been intrigued by latest gadgets and gismos. He is currently pursuing computer science engineering from Hindu College of Engineering. 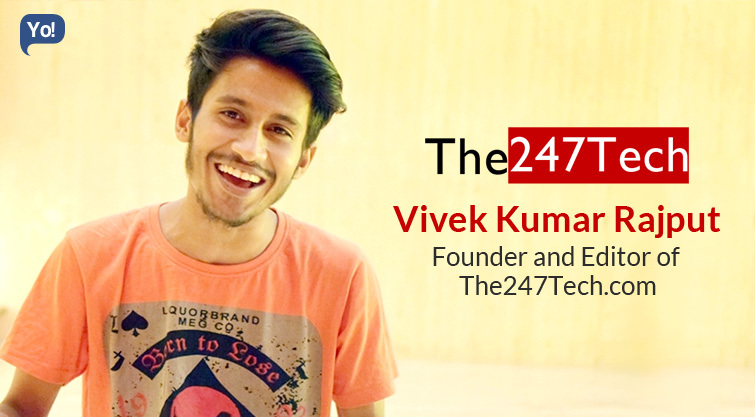 During this time, he felt the need to start writing about technology, which resulted in this first venture, The247tech.com. It is a technology blog and review website which showcases all thing related to technology. In a short span of time, the website has garnered numerous readers and has become a one-stop destination for technology related news. Back in 2010, I started my journey with Trading after 1.5 years I dropped everything. Then I was introduced to term Blogging & Started a Blog. However,unfortunately that was my second failure. After few years back in summer 2015, I started this thing and today it is one of the popular products in Tech Industry. I think my failure inspired me to do something that I even did not knew at that time. Today I design, I Optimize, I create and I Share. It is like Bonus learning. Do not let yourself down because it is all about you vs you. Do not expect anything just make anything to my thing. I purchased a domain, I purchased a hosting. & I learnt from my failures. Total estimate is 5,000 INR with Lots of Hard-work and Dedication. Google Keyword Planner, SEMRush, Yoast SEO, Grammarly. For the hosting look for SiteGround, Bluehost&for Indian Hosting Microhost. These are some tools/Services that impressed me. Do you know I write short stories? Yes, it makes me more productive. Alternatively, I can create a virtual figure of myself who can share the negative thoughts so that I can overtake those thoughts with the positive ones. I am all good with my habits. I do not want to change anything. Why are you jumping on others work? Focus on your with the specific goal. Too much work. &maintain the balance. Now, I know the exact value of Hard-work, Dedication, and money that my dad told me in an early stage. One more thing, If I am doing something, everyone can do that thing but no one can do as I do. I want to work with some exclusive content creator companies. I am a Developer too by education but I love Exploring and Entertaining. Probably I will do the comedy & Music too. Again? I will Guide others with an enhanced version.